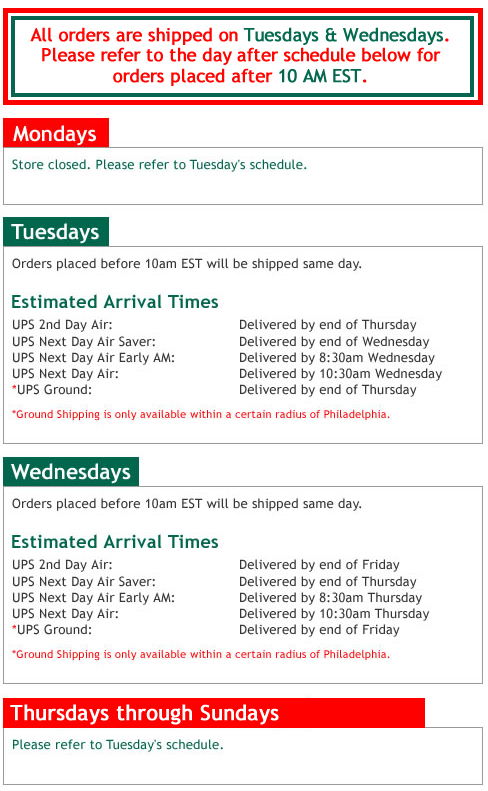 UPS shipping is available Tuesday, Wednesday, and Thursday weekly. Any order placed before 10am on Tuesday, Wednesday, Thursday will ship out same day. Any order placed between Thursday 10:01am EST to Tuesday 9:59am EST will be shipped out on that Tuesday. A UPS overnight and second day shipping quote willl be given at time of check-out on site. All UPS shipped orders are packed in a two piece insulated cooler with dry ice. Please read the chart below for shipping and estimated arrival days.